While all oak trees produce seeds in the form of acorns, some oaks may also present with large, round growths that closely resemble grapes or berries. These growths, called galls, are not a reproductive part of the plant, as are true berries. Rather, they are an outgrowth of the tree in response to the activities of certain types of wasps, which use the tree to lay their eggs. Oak galls sometimes resemble purple berries. Oak galls can form in a variety of shapes, including smooth, spiked or rough-surfaced. The galls can also range in size from small growths only a few millimeters across, to over an inch in diameter. The color of oak galls can vary from green to tan, red or even purple, often with a mottled appearance. The interior of the gall is typically spongy and firm. Gall are caused by several species of small wasp, called Cynipid wasps, which use oak trees to lay their eggs. Female wasps seek out the newly grown stems of the tree and lay their eggs in the bark, at the same time injecting special growth-regulating chemicals into the stem. After the eggs are laid, they winter over for three to five months. The hatching eggs trigger the tree to respond to the growth chemicals and begin forming a gall. The gall acts as a protective environment and also a food source for the wasp larvae, which live in the center of the growth. When mature, the adult wasps burrow to the surface of the gall to escape. Oak galls typically occur in the foliage and thinner branches of an oak tree. While sometimes attached to the leaves themselves, they are most likely to occur along new stems, where they often resemble large berries growing from the tree. 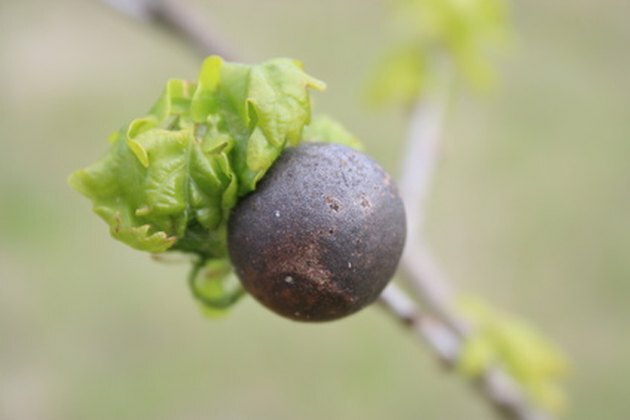 While the "berries" of oak galls, when numerous, can disfigure an oak tree and may be considered unsightly, there is no real risk to the tree from the wasps. No effective treatment to prevent the occurrence of oak galls is available, as the gall protects the larvae from pesticides, and the adult wasps are rarely seen.